If you have arrived here in search of the best dog anti-chew spray, chances are good the situation is urgent! This may be even more true if you are searching for a puppy anti-chew spray to help you and your home furnishings make it through the teething phase of puppyhood! Or perhaps you have recently adopted an adult dog who is a little anxious about the rehoming process and is taking out that worry on your table legs. Either way, you’re here because you need to find the best no-chew spray for dogs ASAP! In this article you will learn about the best anti-chew spray for dogs and for puppies. You will also be able to read no-chew spray for dogs reviews by canine experts and discover the safest chew spray options! According to canine experts, dogs chew for the same reasons many of us check our smartphones every two minutes! 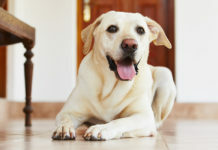 Dogs want to explore their world, keep up to date with what is going on, stay connected with others, and avoid boredom. Additionally, a dog may chew to relieve anxiety, ease hunger, establish ownership, express displeasure or just because what they are chewing on smells or tastes really good! 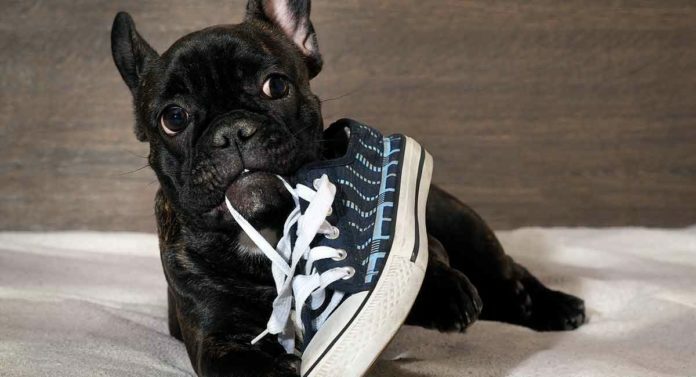 And if the chewed item smells like you – your dog’s favorite person – it is probably first on the list to get chewed (which explains the eternal allure of slippers). Items made of wood and leather or which are soft or stuffed are also fair game for a good chewing session. Safe use note: If you have an antique or heirloom item your dog seems eager to chew, be sure to do your research before spritzing it with the best dog anti-chew spray to verify that the spray won’t harm your irreplaceable items! Unfortunately for you, the family canine can’t tell the difference between a wooden toy and a wooden table leg. If she is permitted to chew on the former, why would the latter be off limits? The same holds true for unsafe but highly chewable items. To your pup, stuffing is awesome! It is delicious, filling, and has a great mouth feel! She has no idea that all that padding she just exhumed from your sofa pillows and swallowed may even now be causing a dangerous intestinal obstruction inside her body. This, of course, is where non-chew spray for dogs becomes essential to keep your dog safe. No-chew spray for dogs is just another way to communicate about what she can safely chew and what needs to remain off-limits. On that topic, establishing and maintaining chewing safety is never more vital than during the teething process. If you have a puppy, she should be introduced to puppy no-chew spray sooner rather than later. 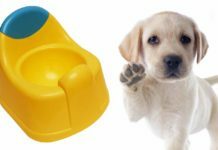 This will help her to quickly tell the difference between her safe puppy teething chew toys and the potentially toxic contents of the family trash can. Dog anti-chew spray, like a firm “No!” or “Drop it!” when the situation calls for it, is a training tool like any other to help your pup learn to navigate family life safely. Choosing the best no-chew spray can sometimes require a process of trial and error to find the scent/taste that your dog really dislikes the most. For example, even though bitter apple and chilli pepper are commonly used for dog no-chew spray, you won’t have to search for long to find someone whose dog loves the smell and taste of one or both! So you need to have a few options to try out in case your first choice doesn’t work quite like you expect. Spritz some of the spray on a towel, tissue or paper towel. Offer it to your pup to sniff and mouth. If your dog eagerly chews up your offering, this is not the right spray for you! If you see your pup avert his head, spit out the item, drool, retch or run to his drinking bowl, you have just found your anti-chew spray. 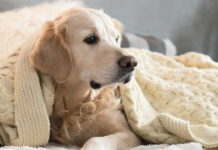 It can be a short hop from using anti-chew spray to keep your dog from chewing the crown molding to using it to keep your dog from chewing and licking a healing injury or surgical site. But don’t use the anti-chew spray for this purpose without talking with your veterinarian first – some sprays can really sting, burn or irritate your dog’s skin! Even the best anti-chew spray may not be sufficient on its own to permanently redirect your dog’s chewing energy. For optimal results, use your new dog anti-chew spray as part of a more comprehensive household training program. For example, when you see your dog select a dog toy to chew on, you can react with positive reinforcement – praise, pats, love and treats are all appreciated! 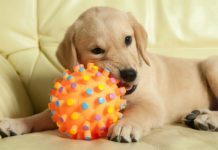 This way, your dog knows to expect more of the same the next time she selects that toy to chew on. It is also important to notice if your dog’s desire to chew is turning destructive. Dogs chew to fulfill natural instincts, but they may also chew to communicate that they are bored, lonely, stressed or for some other reason. 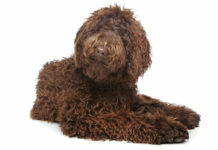 When your dog’s chewing becomes a problem, it is time to seek help from your veterinarian or a professional dog trainer! These puppy chew spray products are safe and effective to use with teething puppies. They can also be the best dog anti-chew spray options for adult dogs. Bodhi Dog Anti Chew Spray Puppy Training Treatment. This popular and highly-rated anti-chew spray is safe for use with puppies as well as adult dogs and senior dogs. The bitter lemon flavor is made from natural, non-toxic essences. The manufacturer states it is safe to use on all types of household furnishings. Emmy’s Best PRO Anti Chew Spray for Puppies and Dogs. This alcohol-free bitter spray comes with a free 14-day online training program to help you eliminate chewing at home. The manufacturer offers a 1-year satisfaction guarantee. Wolfe & Sparky NEW & IMPROVED Organic Chew Buster. This organic, all-natural, sulfate-free, alcohol-free, paraben-free chew deterrent is made in the USA and can be spritzed safely on belongings, furniture, the trash can, the trash itself and even your puppy’s skin and coat (with your vet’s approval). The reviews for these dog no-chew spray products indicate they represent some of the best dog anti-chew spray options you can test with your chew-happy dog! Grannick’s Bitter Apple Spray. Grannick’s Bitter Apple is a time-honored solution for problematic pet chewing. Pet owners praise this spray for keeping even determined chewers away. Rocco & Roxie No Chew Extreme Bitter Spray for Dogs. This formula features double the bitterness in an alcohol-free base. It also includes soothing tea tree oil if you need to use it to keep your pup from chewing on healing injury sites (but for safety, talk to your vet before doing so). Vet Recommended Bitter Lemon Spray for Dogs. This non-toxic, alcohol-free formula is vet-recommended for use on skin and bandages as well as household items. If you simply cannot find a traditional anti-chew spray flavor or scent that your dog really dislikes, do not despair! These alternatives may be just the deterrent you are looking for! SENTRY Stop That! For Dogs Pet Deterrent Spray. This deterrent spray is a two-in-one behavior redirection aid. First, it emits a hiss of plain air and then that is followed with a spritz of pheromones. The combination of the sound and the spray works to redirect your dog’s attention and then calm him. The Company of Animals Pet Corrector. This unique spray deterrent emits only a sharp burst of air that makes an unpleasant hissing sound. This spray easily captures your dog’s attention so you can introduce a more desired behavior. PetSafe SSSCAT Spray Pet Deterrent, Motion Activated Pet Proofing Repellent for Dogs. This unique spray-based system also incorporates motion-activation to release an unscented harmless spray to deter your dog from chewing. Owners say the motion-activated system really works to keep chewing at bay! 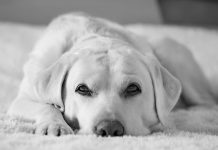 We hope you have found all the information you need in this article about the best dog anti-chew spray for puppies and adult dogs! Please let us know what works for you in the comments box. Pultarova, T., “Why Do Dogs Chew Everything?” Live Science, 2017. Segelken, R., “Study: ‘Nuisance-barking’ dogs respond best to citronella spray collars,” Cornell University, 2016. Block, K., et al, “Chewing: How to Stop Your Dog’s Gnawing Problem,” The Humane Society, 2018. Côté, E., “Clinical Veterinary Advisor,” Mosby/Elsevier, 2015. Davis, S., “Pets behaving badly: What you can do about common behavior issues,” American Animal Hospital Association, 2018.